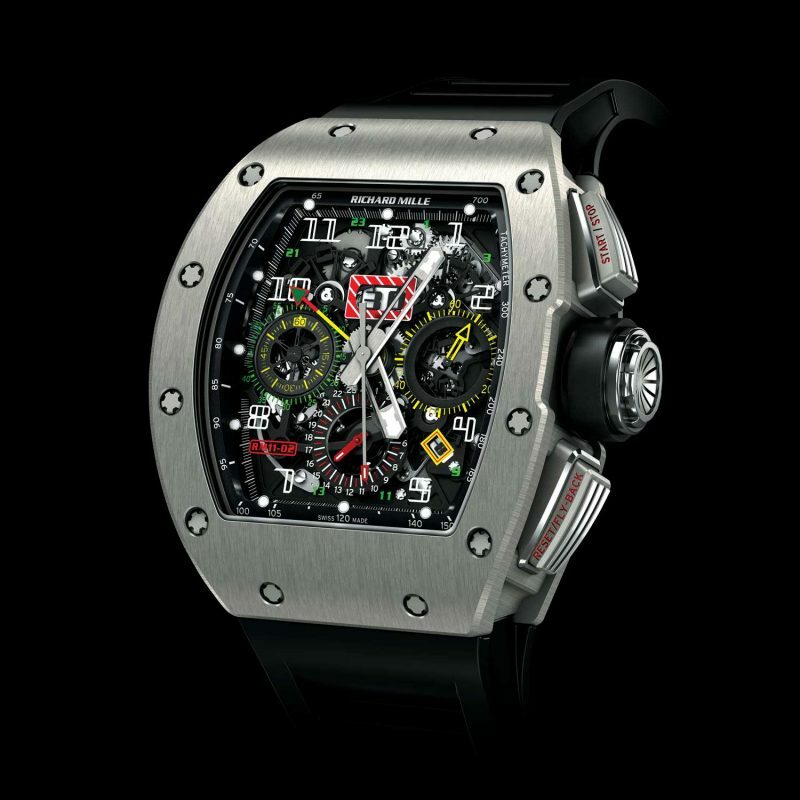 Like so many Richard Mille watches, the RM 011 began with a relationship. 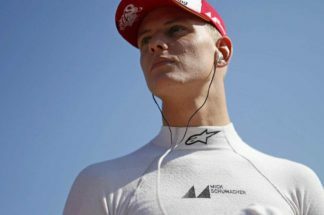 It began with a friendship that transpired between two men — Richard Mille, creator of extraordinary avant-garde timekeeping objects, and Felipe Massa, a young Brazilian Formula One race car driver. 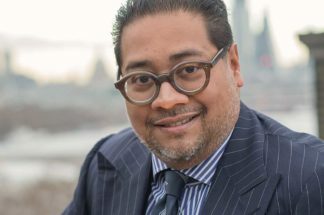 Watches such as the RM 009 tourbillon in ALUSIC (a composite material made of aluminum and silicon carbide), the RM 006 tourbillon with carbon-nanofiber movement baseplate, and the RM 005 were prominently worn by Massa, with the RM 006 notably worn in the driver’s seat as Massa helped provide pre-launch real-world tests of its ability to resist shock and g-forces. 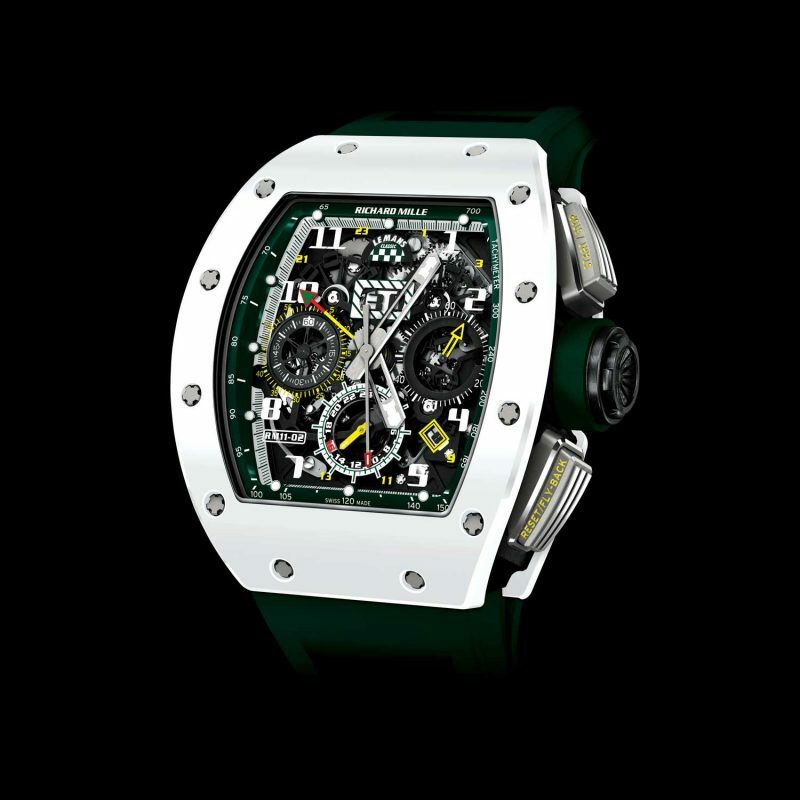 The RM 011 Felipe Massa Flyback Chronograph was launched in 2007 and was immediately recognized as an important part of the Richard Mille collection. Prior to the RM 011, the only two chronographs in the catalog were the RM 004-V2 and the RM 008-V2, both of which were split-seconds chronographs, otherwise known as rattrapante chronographs. 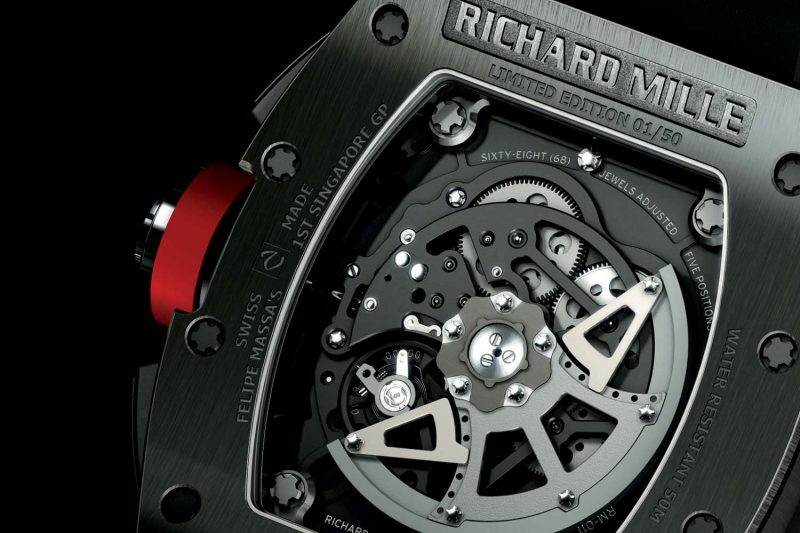 These were high-complication beasts built by Richard Mille’s supplier of innovative complicated movements, Audemars Piguet Renaud & Papi (APRP), and were priced accordingly. In contrast, the RM 011 had an automatic base movement made by Fleurier-based Vaucher — the other main movement supplier of Richard Mille watches — the same one used in the RM 010 (which currently exists as a slightly enlarged, more openworked form of the RM 005). A module by Dubois-Dépraz, a trusted name in the watch industry, brought the additional functions of flyback chronograph and annual calendar to the RM 011. 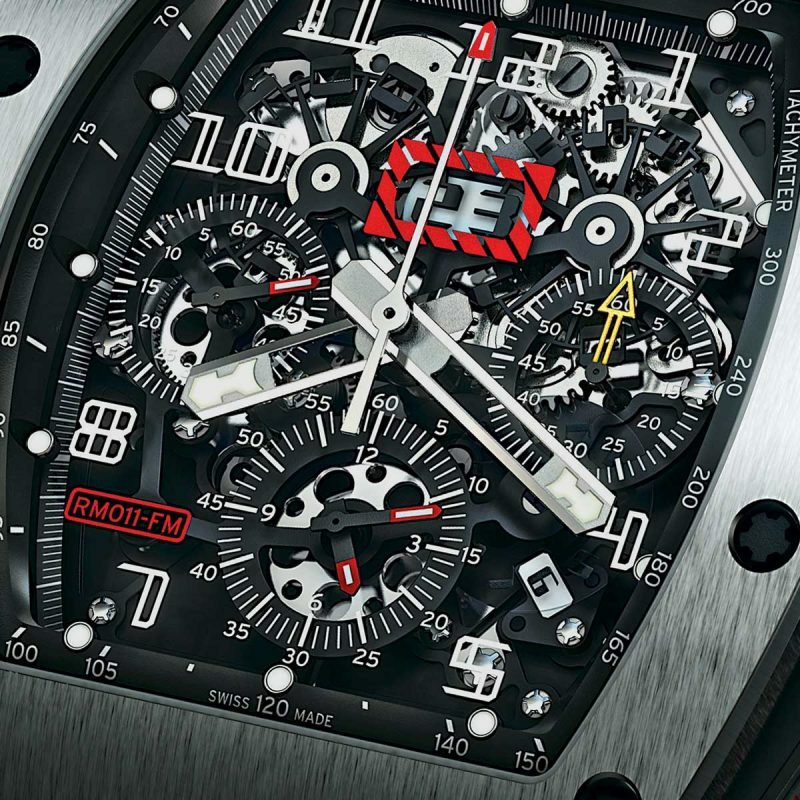 As the standard automatic chronograph of Richard Mille, the RM 011 has worn many guises over the years, from a slew of commemorative special editions to sport-specific versions. 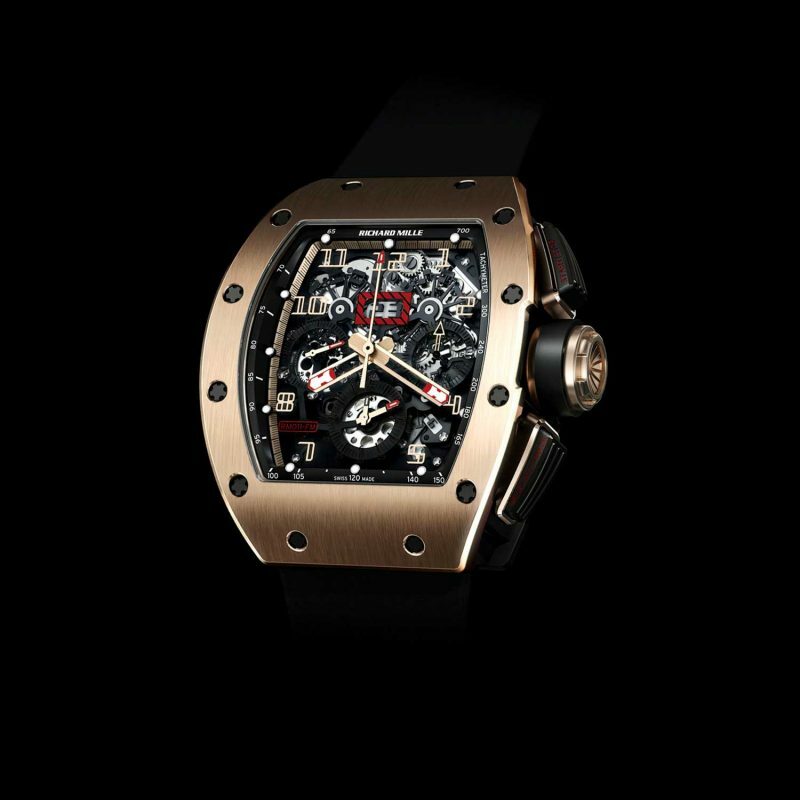 The first RM 011 in 2007 was dedicated to Felipe Massa, by then an established friend of the brand who contributed valuable insight towards the development of Richard Mille watches to suit the high-octane lifestyles of the brand’s customers. 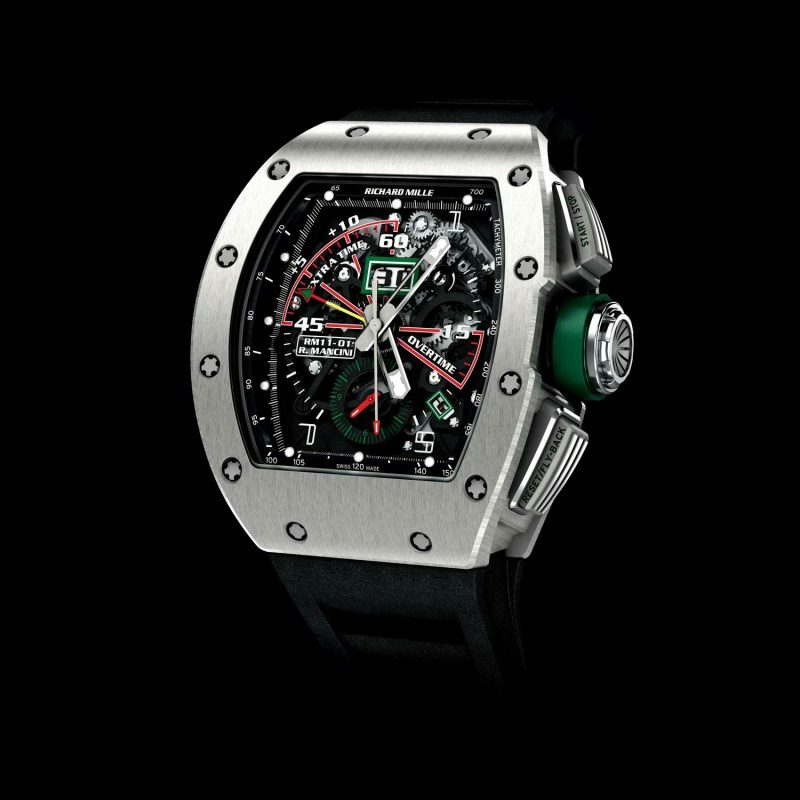 The story of Massa wearing watches during Formula One races was well known and it was commonly understood that the RM 009’s development was significantly marked by Massa’s feedback. 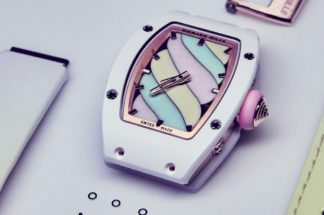 The RM 011 had a transparent dial imprinted with red and white markings, partly to evoke the racing aesthetic, but also to acknowledge Massa’s move to Ferrari from his previous team of Sauber-Petronas. 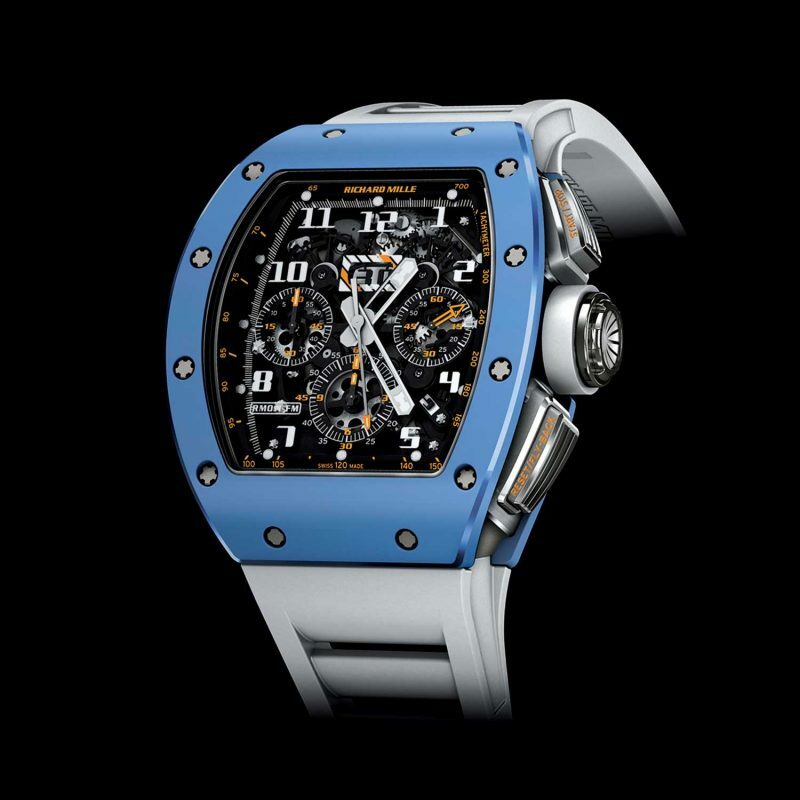 In line with the brand’s relentless pursuit of lightness and racing-inspired materials, the case middle of the watch, shaped as the classic Richard Mille tonneau, was titanium while the bezel and caseback were either red gold or white gold. The carbon-fiber dial flange was stamped with a tachymetric scale. A Super-LumiNova chronograph seconds hand was mounted centrally, co-axial with the hands indicating the hours and minutes. Chronograph minutes were displayed on a counter at three o’clock, whilst small seconds and a chronograph 12-hour totalizer shared a counter at six o’clock. The nine o’clock counter was occupied by a 60-minute countdown display. 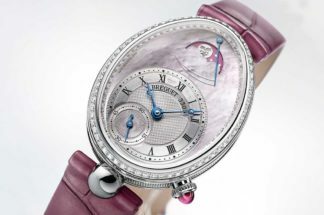 At 12 o’clock was a big date window — the openworked date wheels visible under the transparent dial coming together under the date window and over a white background that allowed for quick and easy reading. An additional numeral indication at four o’clock indicated the ordinal number of the month. Two pushers activated the chronograph, with the pusher above the crown actuating the start and stop of the chronograph, and the lower pusher controlling the zero-reset and flyback function. 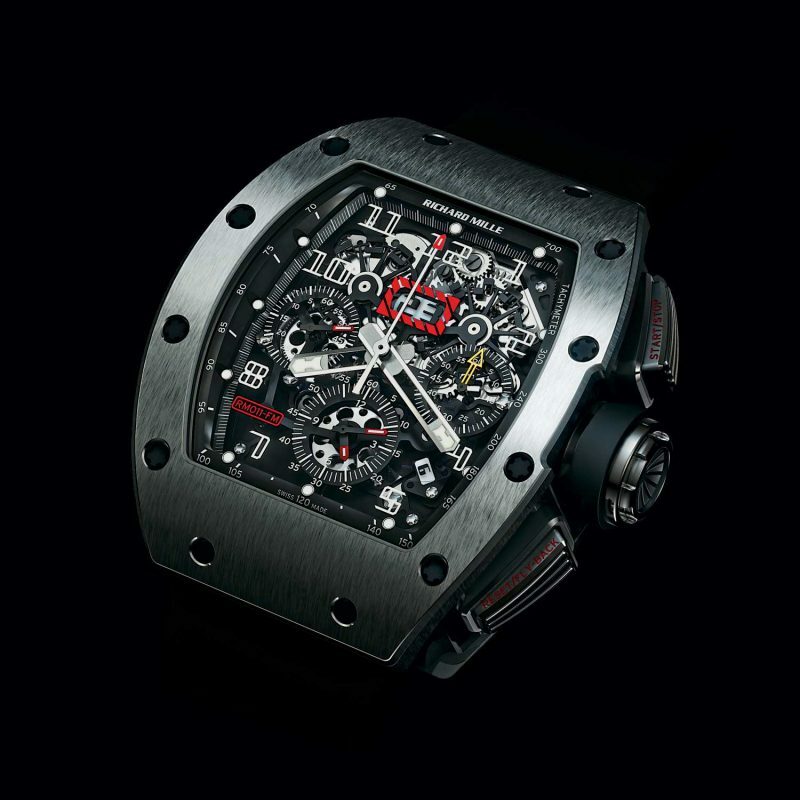 One of the most outstanding versions of the RM 011 to be produced is the 2008 special edition produced in 50 pieces to celebrate the first Formula One Grand Prix held in Singapore, which was also the world’s first night race on a street circuit. The hour numerals were transfer-printed in alternating red and white, and the carbon-fiber dial flange and crown detail were in red, an allusion to the colors of the Singapore flag. The bezel and caseback were in black DLC-treated titanium in acknowledgement of the race being held at night. 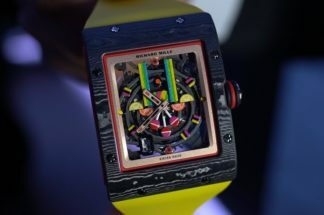 Further engraved on the caseback was a nod to the ongoing friendship between Felipe Massa and Richard Mille — it read “Felipe Massa’s 1st Singapore GP”. 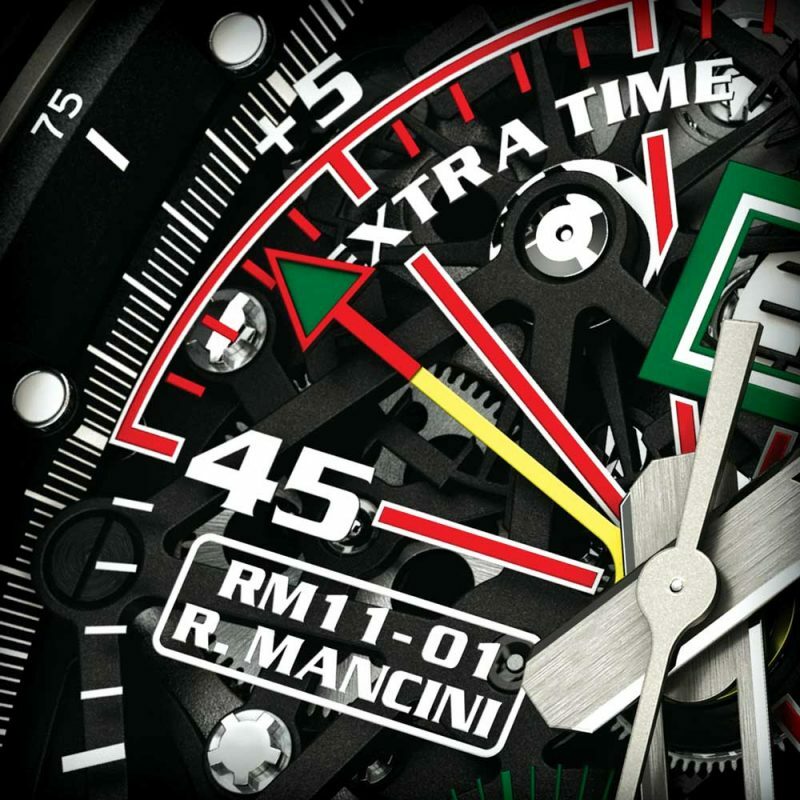 The RM 011-01 Roberto Mancini was a variant of the RM 011, specially adapted to meet the needs of Mancini in his position as the manager of some of Europe’s finest football teams, including Manchester City and Inter Milan. The chronograph minutes hand is now centrally mounted as well and its 60-minute sweep around the dial is divided into 45 minutes of play with up to 15 minutes of extra time and five minutes of stoppage time. Bringing an additional function to the RM 011 family is the RM 011-02, which includes a GMT hand to indicate a second timezone whilst still maintaining the 16.15mm height of the RM 011. On the whole, the various editions of the RM 011 have made it the go-to watch for collaborations with sporting events, whether it be the polo editions or the Le Mans special edition. 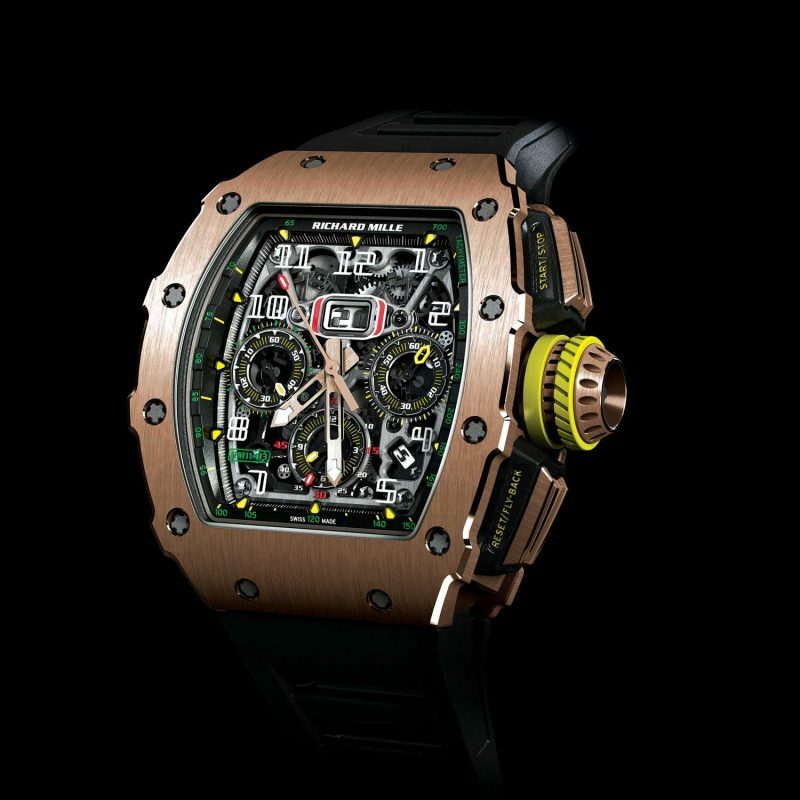 It’s been seen in almost the entire range of case materials that Richard Mille produces watches in — from gold to NTPT (the carbon-nanofiber layered composite that gives some of Richard Mille’s watches their characteristic woodgrain aesthetic). 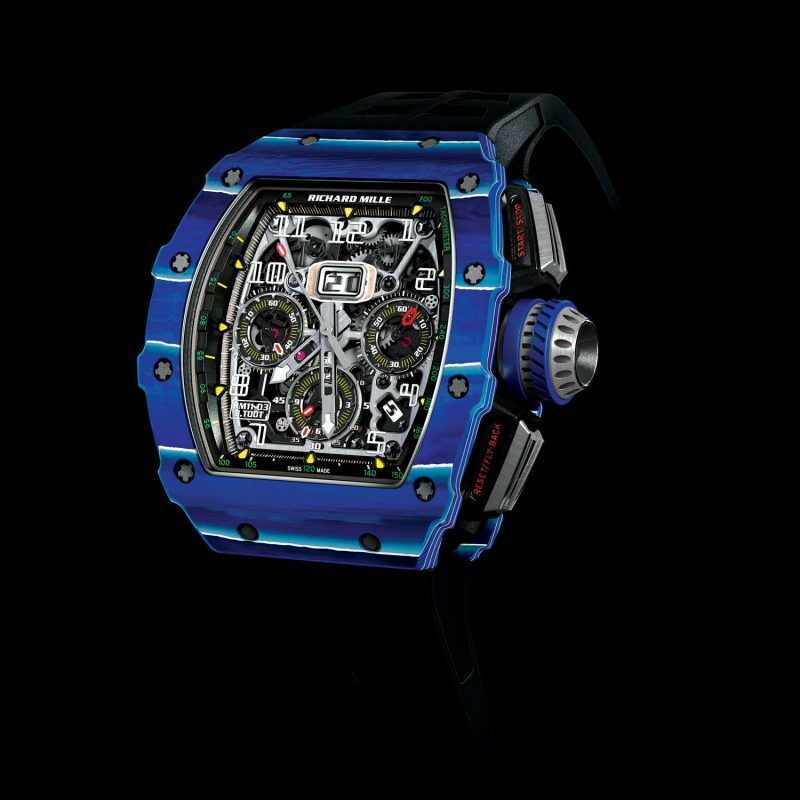 Last year, the RM 011 Last Edition, with a blue ceramic bezel and caseback, became the last RM 011 to be produced by Richard Mille. 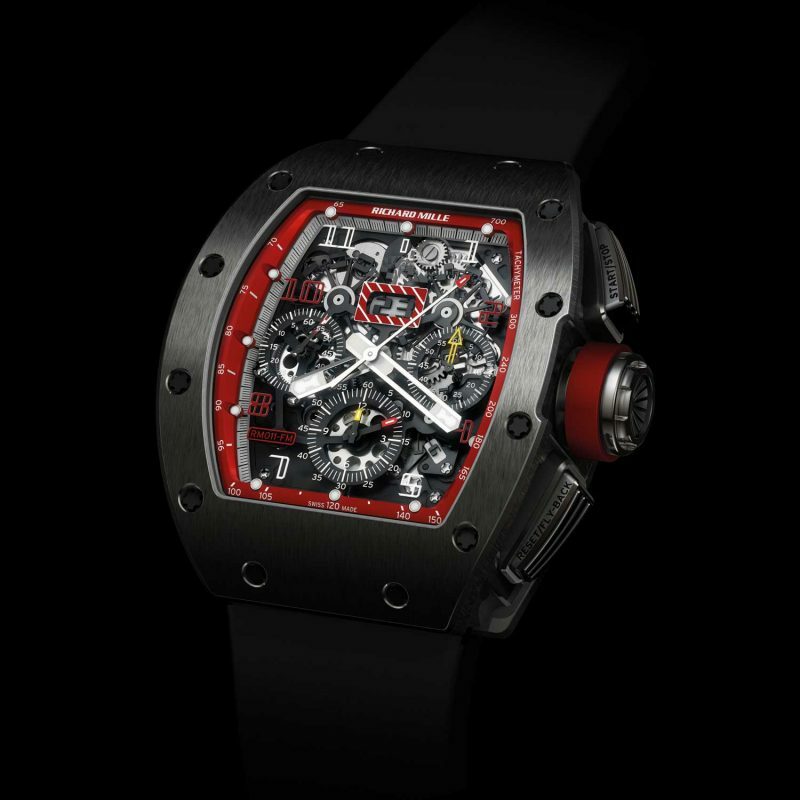 After nine years in the collection, the RM 011 was, in the words of the brand, “due for a makeover”. The RM 011-03, released in the later half of 2016, features a slightly wider case, for a more robust, sportier aesthetic, and its movement is significantly more openworked than that of its predecessor.